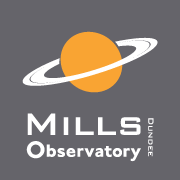 You are invited to join the astronomers at Mills Observatory for this one of their regular open evenings through their winter season (October to March). Observe breathtaking views of the moon and planets and see some of the brighter star-clusters, nebulae and galaxies through their huge state-of-the-art 16 inch diameter telescope. Various space-themed exhibitions are also on show. With free admission and free parking these events offer a fantastic family trip out and great value too (small charge applies to planetarium shows). No booking required -- just turn up! This event is being organised by Mills Observatory who should be contacted if you have any queries. We highly recommend you confirm this event is indeed going ahead before travelling. If you do attend it would be fantastic if you could let the organiser know you found them via Go Stargazing! Please contact Mills Observatory directly for more details regarding this event or, if appropriate, contact the event venue.